Updated contact information. Replaced COPYING.BSD by LICENSE. Split build-and-test scripts to build and test. Minor README updates regarding multiple releases, tutorial usage. Added omitted constant value for M in C routines. Small fixes, avoids emitting redundant shift. 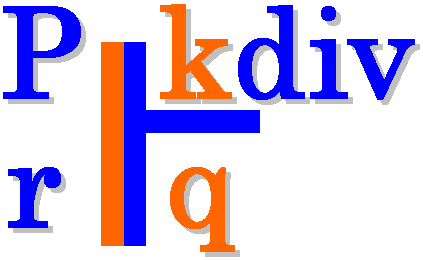 kdiv is a generator for routines for optimized division by an integer constant. It can be used for calculating an integer division with the routines presented in Henry S. Warren's "Hacker's Delight" book. kdiv can also be used for emitting a NAC (generic assembly language) or ANSI C implementation of the division. LICENSE Description of the Modified BSD license. Makefile Makefile for generating the kdiv executable. README.html HTML version of README.rst. README.pdf PDF version of README.rst. build.sh Build script for kdiv. kdiv.c The source code for the application. kdiv.png PNG image for the kdiv project logo. test.opt.c Expected optimized version of test.c. test.sh Perform some sample runs. There exists a quite portable Makefile (Makefile in the current directory). Running make from the command prompt should compile kdiv. generate an ANSI C optimized software routine for the division. ANSI C routines have been tested only for a width of 32-bits (see option below). Report only inconsistencies to the expected division results. Set the value of the divisor (an integer except zero). Default: 1. Set the bitwidth of all operands: dividend, divisor and quotient. Default: 32. Set the lower integer bound for dividend testing. Debug output (-d) must be enabled. Default: 0. Set the higher integer bound for dividend testing. Debug output (-d) must be enabled. Default: 65535. Construct optimized routine for signed division. Construct optimized routine for unsigned division (default). Emit software routine in the NAC general assembly language (default). Emit software routine in ANSI C (only for width=32). Here follow some simple usage examples of kdiv. Generate the ANSI C implementation of n/11 optimized routine. Generate the NAC implementation of n/(-7) optimized routine. 3. Generate the ANSI C implementation of n/23 optimized routine. Also run some tests with an internal generator for the dividend range [0..1024]. The target platform compiler (e.g. gcc or llvm) is expected to inline the kdiv_s32_p_23 function at its call site.